31675 PERCIVAL, OLD BOND STREET, LONDON. 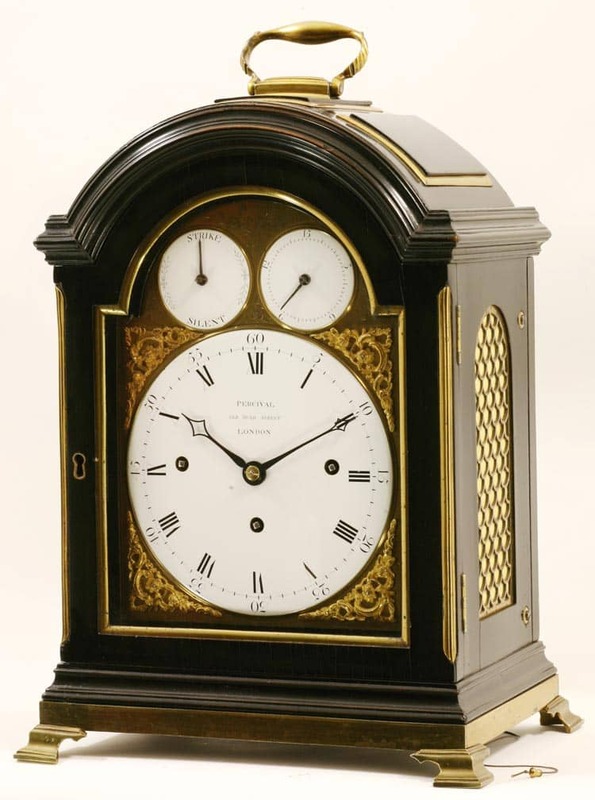 A QUARTER STRIKING TRIPLE PAD TOP EBONISED AND BRASS STRUNG BRACKET CLOCK WITH ENAMEL DIALS. CIRCA 1795. 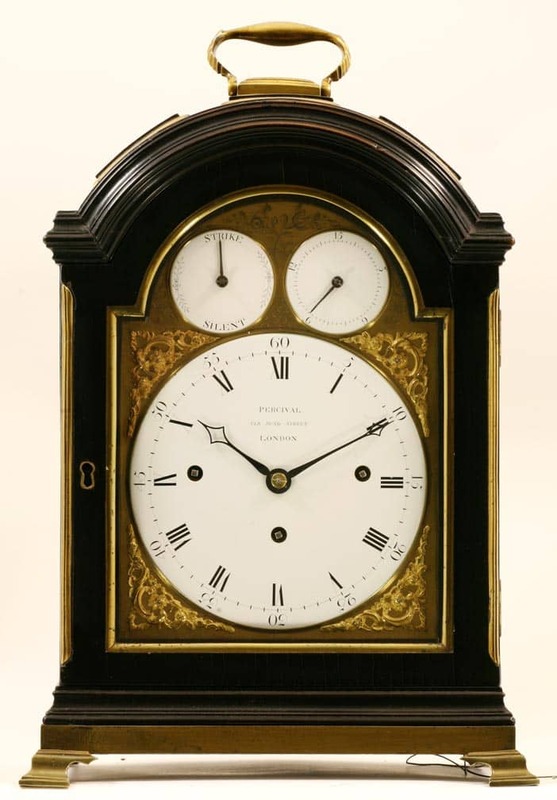 A particularly fine and well proportioned pad top bracket clock. The case with three brass edged pads has silk backed fish scale frets to the sides and brass beading to the door and the canted corners of the case. 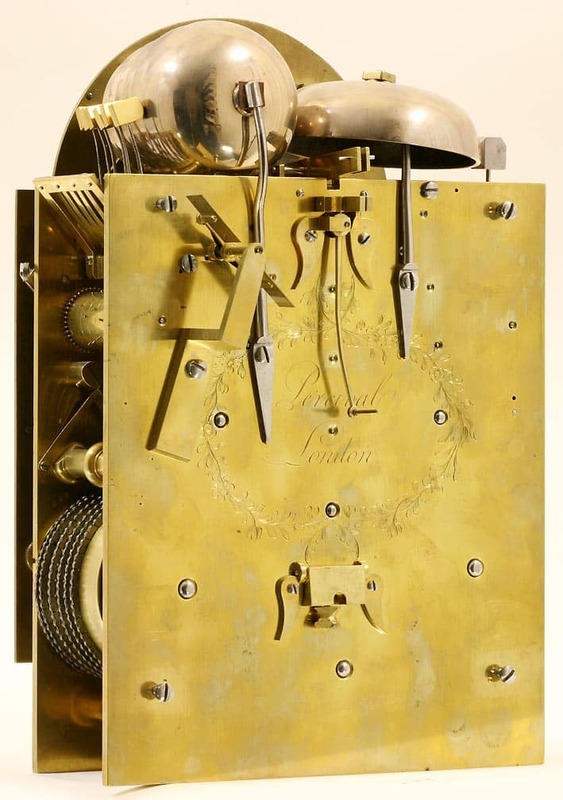 The bottom of the case is enclosed within a large brass band and the clock stands on ogee bracket feet. The mouldings to the arched top are strong and well executed. The brass dial has three enamel dials set into it and held in finely worked bezels. 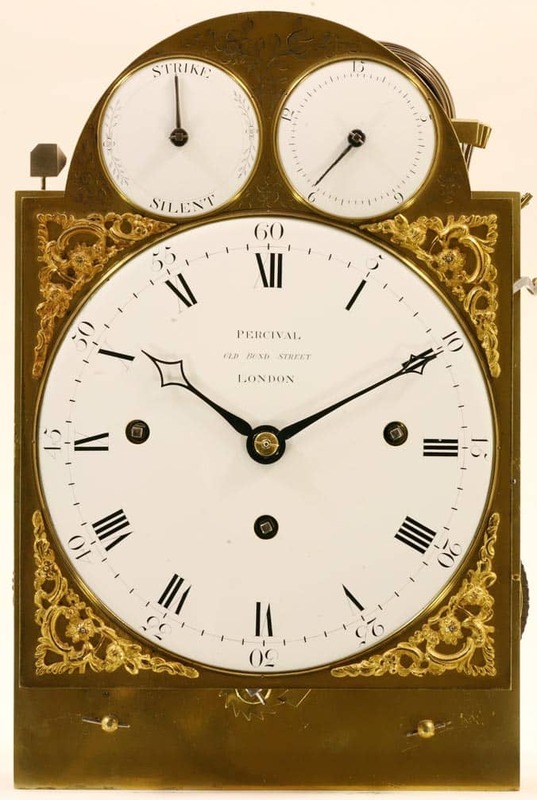 The two small dials in the arch are for strike/silent and for pendulum rise and fall and the brass dial plate behind them is nicely engraved with floral swags. The main clock face is signed in the porcelain for the maker ‘Percival, Old Bond Street, London.’ It has Roman hour numerals with outer Arabic minute numerals. There are four well cast spandrels. The hands are unusual with a well fretted diamond shaped end to each one. The eight day movement has triple chain fusees and anchor escapement and the pendulum has timing adjustment from the dial. 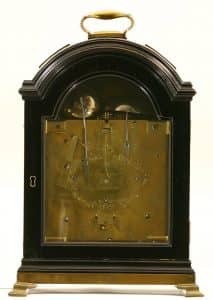 The movement strikes the hours on a bell mounted above the movement and strikes the quarters on a nest of six bells employing six hammers. The backplate is signed within a florally engraved cartouche for the maker ‘Percival, London’. It has a pendulum hold fast in the middle of the plates and is secured in the case with four brackets. The movement and bells completely fill the case. The maker, Thomas Percival, is noted as working in Old Bond Street in the late 18th century.